It was the winter of 1968; I was just 15. 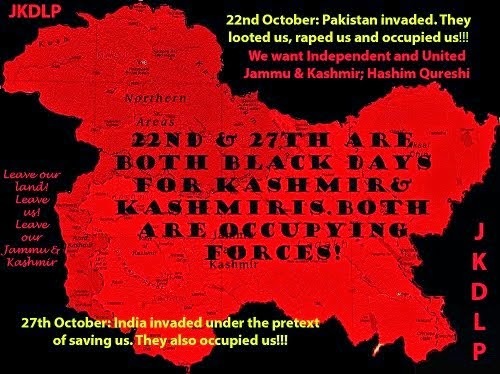 Nevertheless conscious that final decision of Jammu and Kashmir State was pending and freedom invariably meant Pakistan. I knew very little about Maqbool Bhat. Then suddenly in December 1968 we found large size posters carrying pictures of Maqbool Bhat, Yasin Sahib and Mir Ahmad displayed on the walls in Srinagar city. The caption said: “dangerous criminals who had fled from the central jail and anybody giving information about their whereabouts would be rewarded with ten thousand rupees.” I pulled down hundreds of these posters in Lal Chowk and its adjoining areas, taxi and bus stands, Dalgate area and its surrounding places and tore these to pieces. This was my first meeting in absentia with Maqbool Bhat. In 1969, passports were issued to my mother, grandmother, my maternal uncle and my younger brother and sister. In January of that year we crossed over to Pakistan via Ganda Singh, Ferozpore route. I had such fascination for Pakistan that no sooner did I cross the border and landed on Pakistani soil, than I not only bowed my head to show reverence to the land of Pakistan but also kissed the soil. A Pakistani soldier in uniform asked me what did it mean? I said that “Pakistan was no less than Mecca and Medina for us and that is why I kissed the earth.” I did not understand the deeper meaning of his retort at that time. He said,” Khoja go inside and see the Mecca and Medina”. We headed for Peshawar, our destination. From my maternal uncle I came to know that Maqbool Bhat also happened to be in Peshawar at that time in Qissakhwani Bazaar. I was just thinking of arranging a meeting with him when Maqbool Bhat dropped in the house of my maternal uncle. This was my maiden meeting with him in person. When I recounted to him the story of my tearing the posters in Srinagar, his face lit bright. I never knew that my words would turn the brightness of Maqbool Bhat’s fair face as a beacon of light for me in my future life and that it would change the entire course of my life. He promised to meet us next time and left.He paid us another visit shortly and took me along with him to Khyber Café in Peshawar Sadder. The café was the hot bed of political discussions in those days. It was also the rendezvous of Wali Khan’s party and Pukhtoon Students Federation. People talked anything from local to international politics. It was in this café that Bhat Sahib had introduced me to many revolutionaries from the Frontier, included among those were Latif Afridi, advocate Sarfarz, Afrasiyab Khatak and many more progressive thinkers of the day. 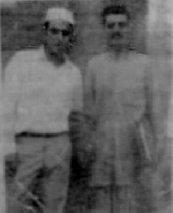 This was also the beginning of Maqbool Bhat’s role as my mentor and teacher. In my political life of forty-two years, I have never met a person with such deep-rooted sentiment for the freedom and prosperity of his compatriots as Maqbool Bhat. In our fourth or fifth meeting, he took me with him to Rawalpindi. We landed at the residence of late Dr. Farooq Haider. It was my first meeting with Dr. Farooq Haider, his wife Baji Iffat and Javed Sagar, the son of Allah Rakha Sagar. Again it was this place where I met Amanullah Khan for the first time. I stayed in Pakistan for nearly six months. I had occasion of visiting Muzaffarabad and Muree in the company of Bhat Sahib the Martyr. In Muree I met with Yusuf Sahib and Pervez Mir and many more friends. In Muzaffarabad I met with Yusuf Zargar, Ghulam Mustafa Alavi and Raja Muzaffar and many more. 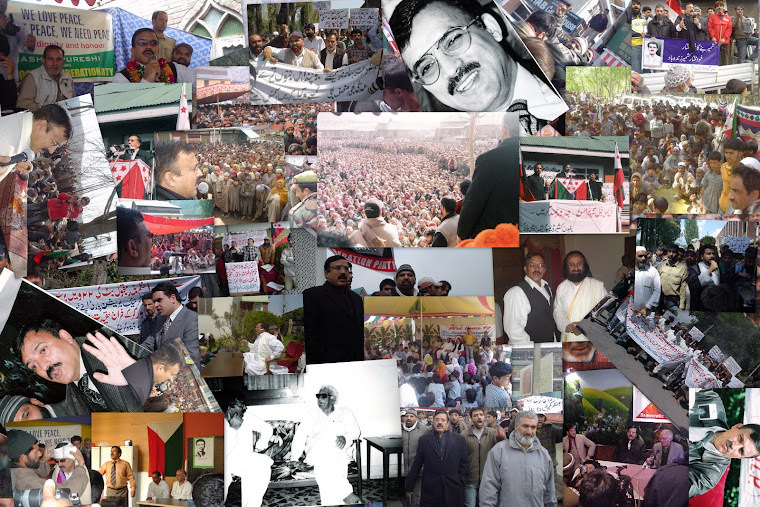 The common denominator of all of them was their immense love for Jammu and Kashmir and its people. 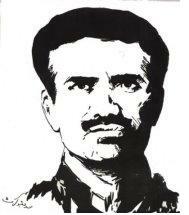 Maqbool Bhat had lit a flame in their hearts which one thought would engulf the entire sub-continent. Their hearts were filled with the sprit of patriotism. Maqbool Bhat’s injection of nationalist sentiment in me was so profound that I forgot that I had yet to complete my studies. I had only competed Matriculation. I had the responsibility of taking care of my parents, maternal uncle and my younger sister and brother. I overlooked all these duties and gave myself up entirely to the ideology inducted by Maqbool Bhat. He made me the elementary member of National Liberation Front and entrusted to me the organizational duties of Kashmir zone. I was trained to create small cells and the sound of independent Kashmir resounded in my ears for the first time. He armed me with the logic for raising such a cry. At the time of my return he jotted down all organizational details on a piece of paper and hid it in the inner lining of my karakuley cap. I was made to impress my signature on the NLF membership form in my blood. I distinctly remember that one of the stipulations of the membership form was that of non-communal and completely independent as against enslaved and oppressed Kashmir. Anybody qualifying for membership had to imprint his signature and thumb impression in his blood. Those going from Srinagar and other parts of the State to meet with their relatives on the other side of the State were particularly in his focus. 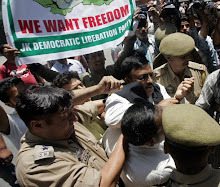 He prompted them to infuse the ideology of independent Kashmir in the mind of their relatives. In Azad Kashmir, he would hold corner meetings and in public rallies he used to cite small examples to invoke the spirit of nationalism among his audience asking them to become the masters of their land. I am talking of the days when Muslim Conference enjoyed predominance in Azad Kashmir and the cliché was that one who did not adhere to Muslim Conference ideology was not a Musulman. Anything outside accession to Pakistan was considered a conspiracy against Pakistan. In these strongly blowing winds, organizations like Plebiscite Front for Pakistan, Azad Kashmir and NLF tried to keep the flame of freedom and self-determination alive. Maqbool Bhat was gifted with melodious voice and he dressed elegantly. When he spoke, one felt that the soul of all revolutionaries of the world had converged inside him. He had intense love and affection for the poor. Having lit the flame of freedom in my heart, Maqbool Bhat bade me farewell. I returned to Kashmir. Here I raised small cells each comprising two or three young boys. My difficulty was that my friends looked at me rather askance when I confided to them about independent Kashmir. I wondered why they did not understand the simple thing that this was our house and we are its owners. Today forty-two years later, I find that much human blood has run down the Jhelum and many people know that accession to India or Pakistan is not possible but continue to subscribe to that thinking. We had produced literature in our handwriting and got it printed at litho press for pasting the copies on the walls of the street in the city. Ashraf Qureshi was good at drawing; he would draw pictures showing a Kashmiri carrying a gun in his hand. Our posters for freedom carried the message of armed struggle on the pattern of struggles in Palestine and Algeria. These posters were in fact the first message for armed struggle in Kashmir for freedom and self determination. The purpose was to inculcate consciousness among the people in Kashmir for independence. This was at a time when Sheikh Muhammad Abdullah was at the peak of his influence not allowing any other organization or leadership to raise its head. This article was published in Daily 'Greater Kashmir' on 11th February 2012. Second part will be published soon.